Eukaryotic cells are subdivided into membrane-bounded organelles, each with a characteristic set of membrane proteins. 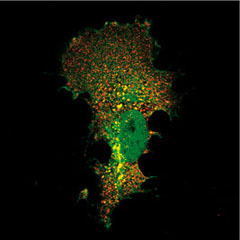 These proteins must be targeted to their correct locations, a process which involves segregation of membrane proteins into small vesicles which bud from one compartment and fuse with another. Equally important for the cell is the ability to remove unwanted or damaged proteins. Misfolded proteins are frequently degraded in the endoplasmic reticulum, but once proteins leave the ER the main route to destruction is via the multivesicular body pathway to lysosomes or vacuoles. This is the fate of proteins whose degradation is regulated - such as activated signalling receptors, or excess transporters and channels. These proteins are marked for degradation by addition of the small protein ubiquitin to their cytoplasmic domains, the attached tag acting as a sorting signal for the multivesicular body pathway. We are currently studying the mechanisms by which proteins are modified and sorted, and seeking novel inhibitors of these processes. Journal of Biological Chemistry 293(14): 5200-5209. Proc Natl Acad Sci USA 111: 16736-16741. Regulation of PTEN/Akt and MAP kinase signalling pathways by the ubiquitin ligase activators Nfip1 and Ndfip2. Proc Natl Acad Sci USA 107: 11429-11434.